Many sales managers learned their craft before the e-commerce boom. Back then, a sales journey was a series of interactions between a sales rep and a prospective buyer—no more, no less. All a manager had to do to tighten their sales cycle was to instruct their reps to add or cut interactions from that chain. The internet has changed all of that. According to CEB Global, 57% of the buying process is already complete by the time buyers interact with service providers. Inspiration, research, and reference checks all happen outside of the purview of the salesperson. Now, shortening a sales cycle isn’t so simple. How can sales managers speed up a process that happens mostly without their knowledge or involvement? Well, they can start with something simple: a new frame of reference. 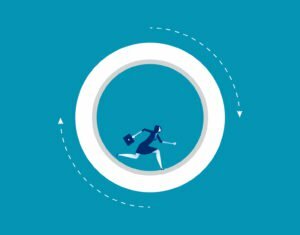 Reframing the “sales cycle” as the “buying cycle” is one of the most important things that sales managers can do to create pipeline predictability. Now, that might seem like splitting hairs, but think of what “buying” captures that “selling” doesn’t. A buying cycle is a holistic concept. It includes what piques the customers’ interest, where they do their research, and what factors beyond sales interactions actually catalyze their purchase. The buying cycle encompasses the totality of experiences that a lead has with your company and the emotions a potential customer feels about your brand. The concept of a sales cycle doesn’t account for how someone feels when interacting with a business, yet a consumer’s emotional response to company messaging has two to three times more impact on their buying behavior than the contents of that messaging. I’ve spoken with a slew of sales managers who have little or no idea about what their target customers are doing or feeling outside of their interactions with reps. In today’s sales environment, if you ignore a company’s non-sales customer data, your customer’s online behaviors, and marketing’s role in sales, it amounts to leaving money on the table. 1. Create cross-funnel visibility by merging marketing and sales data. The line between marketing and selling is slimmer than ever before. Salespeople need marketers’ insights into what prospects are doing and saying outside of sales-led interactions. Start by connecting your sales and marketing tools to provide cross-platform visibility to both teams. Say you use Salesforce and Marketo, for example. You can sync those tools to share top-of-the-funnel marketing data with sales, and vice versa. Arming salespeople with additional data facilitates better customer conversations, promotes higher conversions, and supports collaboration between sales and marketing. 2. Determine which behaviors are most associated with buying. Simply having heaps of data won’t help you close the gap between discovery and purchase. You need to be able to peer into that data and discern key actions that indicate a prospect is likely to buy. However, those key actions might not be what you imagine. Say you’re selling sunglasses online. You might assume that someone who clicks through a bunch of frames is on the fast track to purchase, but this behavior might actually indicate a window shopper. Instead, those most likely to buy might be people who upload photos of themselves to check out how they look in a pair. This is an area where marketing and sales need to work together. Merge the teams’ data and invest in the resources required to suss out the signals most correlated with purchasing behavior. Take each website or offline action in turn, and look at what proportion of leads who took it ultimately closed. 3. Align sales with marketing to create a cohesive, goal-oriented team. Speaking of sales and marketing working together, alignment between the two teams is critical for speedier sales. The key is to establish a single goal: growing the pipeline. Depending on what you’re selling and to whom, the process of pushing leads through the pipeline will differ. For a simpler, low-price product, the best strategy will be one that’s scalable and involves fewer touch points; for an enterprise-level sale, teams will need to coordinate complex interactions across multiple channels and stakeholders. Coordination can be challenging, but when marketing and sales work together, they increase organization-wide quota attainment at a 97% higher rate than their peers, according to a study by the Aberdeen Group. Because they’re better at meeting sales quotas, aligned teams also grow revenue at a 64% faster rate and profit margins at a 24% higher rate. In order to coordinate their strategies, teams have to collectively consider their buyer. However, like most things in sales, this is easier said than done. Teams have to come to terms with the fact that each may be operating off an incomplete and possibly conflicting picture of the target customer. Today’s buyers are all over the place. They shop online while standing in line at the grocery store. Sometimes they buy on a whim; sometimes they spend months pinning and unpinning images on Pinterest. To make sense of it all, there’s only one answer: a marketing-aligned, data-driven sales team.